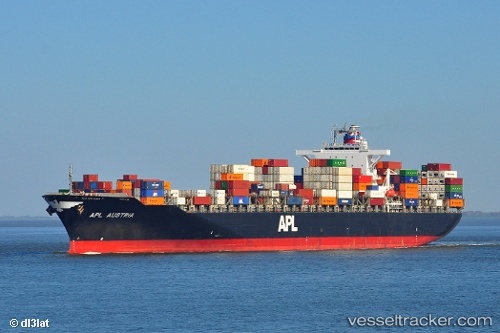 The cause of the fire on board the "APL Austria" was now suspected to have been from a chemical, calcium hypochlorite, as used in chlorine manufacture. The ship was sailing off Jefferies Bay west of Port Elizabeth when the crew became aware of a fire among some containers in number 4 hold. After reporting the fire the ship was instructed to go to the shelter of Algoa Bay where tugs from either Port Elizabeth or Ngqura could assist with trying to extinguish the burning containers on Feb 12. After being unable to extinguish the fire the ship was requested to enter the port of Ngqura where fire fighting crews on the ground could assist and where some of the containers could be removed from the ship to allow access to the fire’s source. After removing a number of boxes ashore the fire was eventually brought under control and put out, allowing an investigation to commence by fire department and port officials as well as the South African Maritime Safety Authority (SAMSA). An investigation has led them to believe that calcium hypochlorite, which is used for the disinfection of water, had been the cause. This chemical was found stowed in containers within the hold. Apparently the ship’s manifest did not reveal the chemical as being on board leaving the crew unaware of its presence on the ship. The "APL Austria" has remained in the port while the investigation has continued and to allow ship repair personnel access to repair the hatch covers damaged by the fire and heat. The "APL Austria" is still docked in the port of Ngqura while mop-up operations continued. No timeline could be given as to when the operation would be completed. South African Maritime Safety Authority (Samsa) technical adviser Captain Daron Burgess said the investigation was still under way and the cause of the fire had not yet been established. There were approximately 62 containers remaining in cargo hold No 4 for discharge. Once the hold was safe for entry, fire investigators would inspect it. The off-loading of the containers was weather-dependent and, on Feb 25, operations had to be stopped due to howling winds. The containers aboard the ship had been severely damaged and this was hampering efforts to retrieve them. The estimated damage to the ship may be in the millions of US dollars.